Matthew Griffin has secured his third top-10 in Japan this season at the Bridgestone Open which sees the Victorian moving back inside the top-10, the ¥4,080,000 (A$51,000) in prize money moving him up to 23rd on the Japan Golf Tour moneylist. Griffin fired rounds of 69-69-67-70 to finish in a share of 9th position at 9-under-par, seven strokes from eventual winner, Japan’s Shugo Imahira. In three seasons on the Japanese Tour, Griffin has forged his way in Japan in search for his maiden tour win. With six professional wins to his credit, three on the Korean Tour and three on the Australasian Tour, including the 2016 New Zealand Open, the 35-year-old is knocking on the door of a win in Japan. In his 20 starts in Japan this season, Griffin has recorded a 3rd place finish at the Japan PGA Championship building upon a 6th finish at The Crowns and has been in the money 15 times. Sunday’s result sees him move to 395th in the world, with his best ranking being 236th in 2014 when he won twice. In 2008, Griffin was the number three ranked world amateur before turning professional. He recorded his first international victory at the Charity High 1 Open in Korea before winning on the OneAsia Tour in Korea at the 2013 SK Telecom Open. This lead to him also winning the OneAsia Order of Merit. In early 2014, Griffin produced one of his most memorable victories to date as well as his first on home soil at the Victorian Open. He won the title in a three hole play off against Matthew Stieger. In early 2016, Griffen was successful at the New Zealand Open claiming victory by a one stroke margin and a top 10 finish at the FIji International. 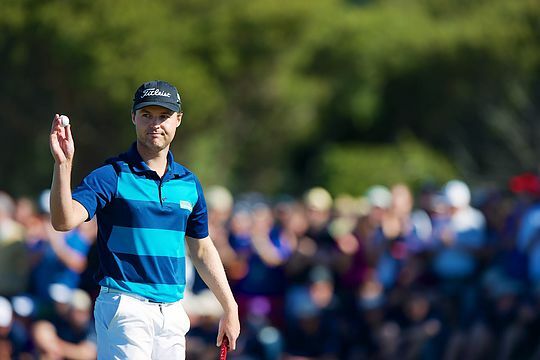 As a result he lead the 2016 PGA Tour of Australasia which enabled him to enter the WGC- Mexico and The Open Championship in 2017 at Royal Birkdale.